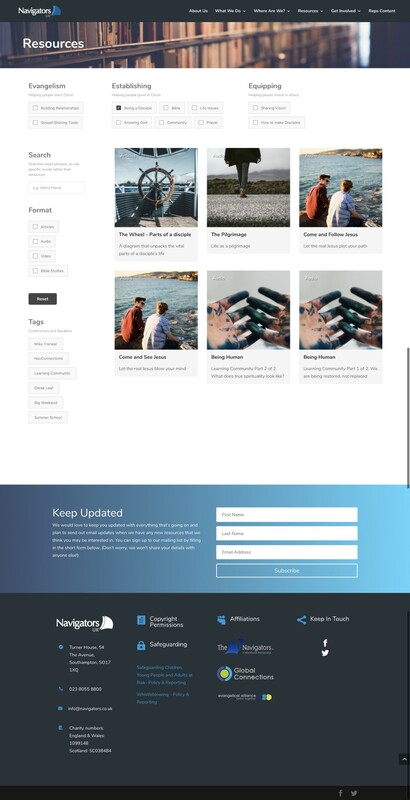 As part of our initiative to provide cutting-edge discipleship resources, we have renovated our resources webpages, improving the search and filtering functionality, creating a more intuitive design and categorisation structure, and renewing the content with brand new material and updated classics. A wealth of free articles, videos, podcasts and Bible studies, as well as a range of paid for publications, are now showcased in a simple, eye-catching format. You can filter these discipleship resources by format and using the three major categories: Evangelism, Establishing and Equipping, each of which has subcategories to drill down into these areas of disciple making. Each resource has a striking image, a pithy description and a blurb, so you can quickly ascertain whether it meets your needs. The resources cover the full range of Navigator experience, from its foundational classics to its very latest material. The common thread is our passion to make disciple-makers in all of life, for the rest of life, from life to life. Also, coming soon: A handy guide on the essentials of leading small group Bible studies.